Smoking is a mass habit of many people, and it brings a lot of inconvenience and discomfort to people around, if the smoker does not comply with the rules of decency and not use the ashtray not to pollute the surrounding area with cigarette butts and ashes from cigarettes. You can make your own hands a convenient ashtray, which will help to maintain order and cleanliness in any situation. To make the ashtray can be a few simple ways. The easiest way is to use as ashtrays any jar with a lid, such as an empty jar of tea or coffee. If you are using a tin can, improve it. Take a sharp knife and the edge of the banks make two slits parallel to each other, so that the distance between the slits is equal to the thickness of the cigarette. Fold the notches outward, the angle between the cut and the jar was a little less than 90 degrees. In this case, you will be able to put a cigarette on the folded edge of the banks, and it will stay without falling inside. Another option ashtrays can be made from a simple plastic bottle of any size. Cut with a knife the neck of the bottle and cut the holder in analogy with the holder in a metal pot. Before you can use the bottle as an ashtray, pour water into it – otherwise, the bottle can melt, due to sparks and hot ashes. If you have nothing at hand, except for mugs or glasses, use them instead of the ashtray. 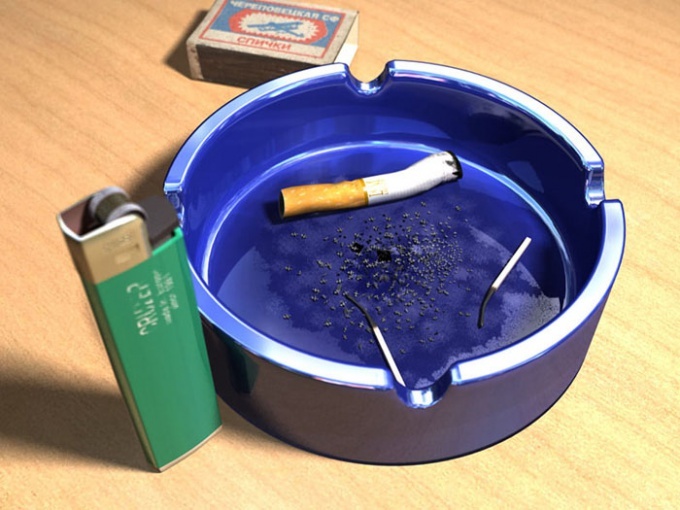 In addition, as an ashtray you can use an empty package of cigarettes, which can be a any smoker. Tear off the lid on a flat line from the packaging, and then insert the cover in the pack of cigarettes, leaving a small slit at the top. This pack of cigarettes will effectively serve as a temporary ashtray. In the case of Smoking in nature and lack in the immediate environment of the boxes, use a tightly rolled bag of several layers of tough paper. Try not to burn the paper – this disposable ashtray will help keep the purity of nature.